Researchers identify new epigenetic pathway driving breast cancer progression. Researchers at UT Southwestern Medical Center have uncovered how the body’s inflammatory response can alter how estrogen promotes the growth of breast cancer cells. The researchers have identified how a combination of signaling molecules inhibits the growth of breast cancer cells, improving clinical outcomes for some subtypes of breast cancers. The opensource study is published in Molecular Cell. The combination, the steroid hormone estradiol and the proinflammatory cytokine tumour necrosis factor alpha (TNFα), act to expand the number of sites where estrogen receptor alpha (ERα) can bind to the genome in breast cancer cells. The new sites of ERα binding turn new genes on and off, which alters the growth response of the breast cancer cells, inhibiting their growth and improving clinical outcomes in certain cases. The newly identified gene set can be used as a biomarker that can help physicians determine who is at risk and how they might react to certain therapies. The current study uncovered the molecular mechanisms that alter the expression of the new set of genes in response to estradiol and TNFα, and identified potential target genes for future therapy. Since the altered pattern of gene expression can predict outcomes in breast cancer, there are important diagnostic and prognostic implications. Approximately 12.3 percent of women will be diagnosed with breast cancer at some point during their lifetime, and nearly 2.9 million women are living with breast cancer in the United States, according to statistics from the National Cancer Institute (NCI). About 232,670 new cases were reported in 2014, constituting about 14 percent of all new cancer cases. About 40,000 deaths were attributed to breast cancer in 2014. The team explain that cancer cells release signals that can prompt the body to respond with an inflammatory response. As part of this response, TNFα is released and can impact the growth of the cancer cells. Previous studies suggested that inflammation might exacerbate the cancer, while the present study suggests that, in some cases, it might actually promote a better outcome. 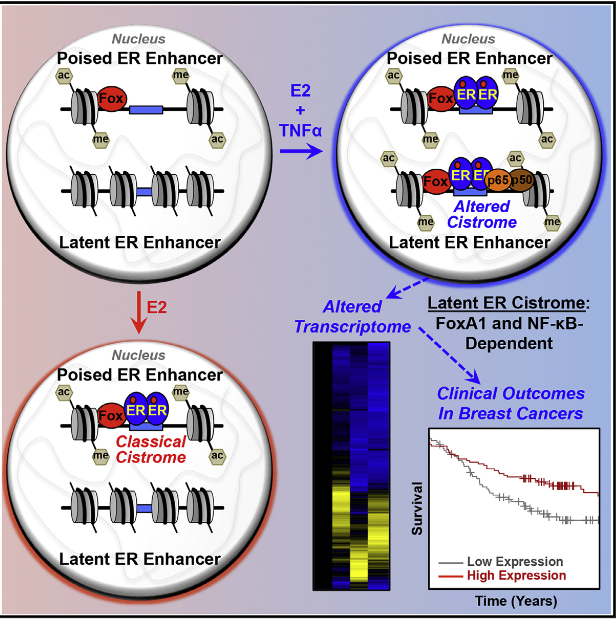 The current study revealed that, when present together, TNFα and estradiol cause ERα, a nuclear transcription factor that is present in about two-thirds of breast cancers (so-called ER+ cancers), to bind to new sites in the genome where the protein does not bind with either TNFα or estradiol alone. These new ERα binding sites allow altered gene expression and, for some subtypes of breast cancers, inhibit the growth of cancer cells. Since the effect only happens when the two are combined, the team surmise that the medical community can use the altered gene expression patterns as an indicator that both agents are at work in the cancer and as a biomarker that may help determine who might be more at risk and how they might react to therapy. The interplay between mitogenic and proinflammatory signaling pathways plays key roles in determining the phenotypes and clinical outcomes of breast cancers. Using GRO-seq in MCF-7 cells, we defined the immediate transcriptional effects of crosstalk between estradiol (E2) and TNFα, identifying a large set of target genes whose expression is rapidly altered with combined E2 + TNFα treatment, but not with either agent alone. The pleiotropic effects on gene transcription in response to E2 + TNFα are orchestrated by extensive remodeling of the ERα enhancer landscape in an NF-κB- and FoxA1-dependent manner. In addition, expression of the de novo and synergistically regulated genes is strongly associated with clinical outcomes in breast cancers. Together, our genomic and molecular analyses indicate that TNFα signaling, acting in pathways culminating in the redistribution of NF-κB and FoxA1 binding sites across the genome, creates latent ERα binding sites that underlie altered patterns of gene expression and clinically relevant cellular responses. TNFα Signaling Exposes Latent Estrogen Receptor Binding Sites to Alter the Breast Cancer Cell Transcriptome. Kraus et al 2015.